Roy C. McHenry was a Special Agent with the Bureau Of Investigation (later named the FBI) from 1917 - 1920. Upon leaving he went into law practice in Binghamton, New York. During the 1950's, McHenry wrote an article for the Retired Agent's Society magazine, "The Grapevine," and reveals his recollections of Agents having firearms in the Bureau in 1917. This is some seven years prior to the appearance of J. Edgar Hoover as Director in 1924. 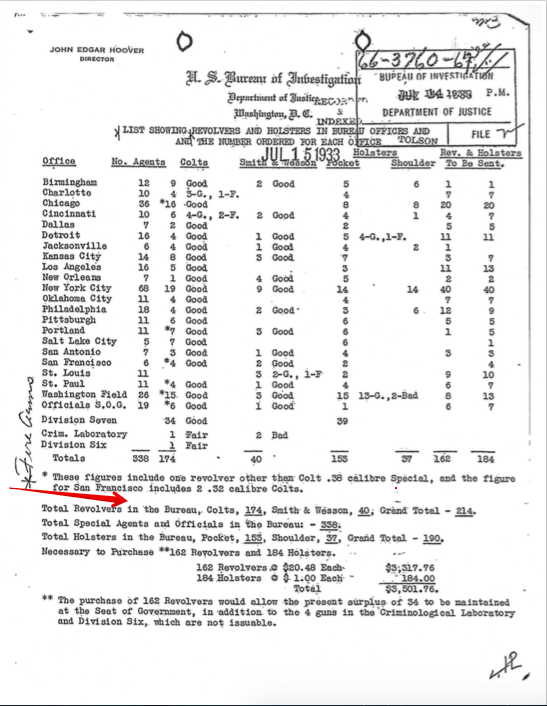 We do know that evidence available, some on this site, reveals that during the post Hoover era - at least until 1933 - a limited amount of weapons were kept in field offices, but not routinely carried. In all liklihood, during these very early days of the Bureau, handguns were purchased on a "piece meal" basis locally by the field offices and not in any large quantities from Smith and Wesson or Colt. A 1933 document listing guns on hand with the Bureau might add some weight to this. In 1945, McHenry along with Walter S. Roper, wrote "Smith And Wesson Hand Guns". Read McHenry's account of his early days by clicking here.